With 2017 behind us, the news cycle is still stirring up stories on artificial intelligence (AI) and machine learning (ML), but has some of the excitement worn off? We're witnessing a surge of activity in the space, with unexpected names like Ferrari throwing their hat into the ring, or some notable failures like a smart suitcase fleeing it's handler. Can actual examples of AI in the enterprise rise among some of the noise that's inundating the market and hindering the credibility of everyone? This has happened before. 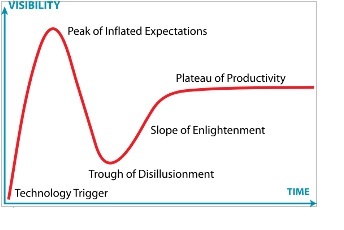 Emergent technology faces a gauntlet, and Gartner's famous Hype Cycle model can help illustrate this point. At the top of that hill is where people start to question whether the technology that was introduced is truly capable of delivering what it claims. This is where harsh criticism hits from multiple angles, and the negativity can be so strong that some companies or technologies actually fail at this point. Yet, if the technology weathers the storm, there is now a time for level-setting and a more realistic understanding of the market. We're seeing that artificial intelligence and machine learning are two technologies at various points in the hype cycle, but both will follow a similar path. What's unique here, however, is that, due to the nature of AI and ML, there is a second failure option. With this type of technology, results are rapid and it is generally not possible to determine why a specific result was generated. Another frustration is that the speed of execution usually creates the inability to troubleshoot failures in detail. When put into a real-world environment outside of general deployment and testing, potential problems that might not have been obvious in the lab start to appear. We can point to some failures — like a smart fridge misreading expiration dates or smart thermostats mistaking temperature readings — but these are minor compared to what else can happen. We've seen this in racist algorithms or facial-recognition incorrectly misidentifying someone at the scene of a riot. So, is AI and ML worth the hassle? Has it hit rock bottom on the hype cycle without anyway to pick itself back up? IT infrastructure generates data by the second, and while formats are diverse, data is already machine readable. Thankfully, it turns out that computers are already translating information from one representation to another. Once this data is applied to an AI or ML system, it can apply various algorithms to try to make sense of them. This means it's seeking what information is significant or what is interconnected in the vast resources — something that an IT team currently does manually at the cost of countless man hours. AI and ML systems can take these huge swaths of data and order them in near real-time, focusing IT teams on what is truly mission critical. Not only does this free up valuable man hours of the IT team, but it elevates them to expand their daily work into new activities that can enhance the overall agility of the enterprise, rather than acting as a constant ticket desk. AIOps has a huge potential to transform IT and help streamline enterprise operations, by presenting human specialists with actionable events, helping them collaborate more effectively, and learning and improving over time.